I have a impulsive and spontaneous nature. It is very easy for me to drop one thing to start another. My work-space is covered with projects in limbo because of this aspect of my personality. Recently I’ve broken down several of my projects into an escalation style build up of completed minis. I’ve also jumped on the Kanban board bandwagon for organizing these projects. 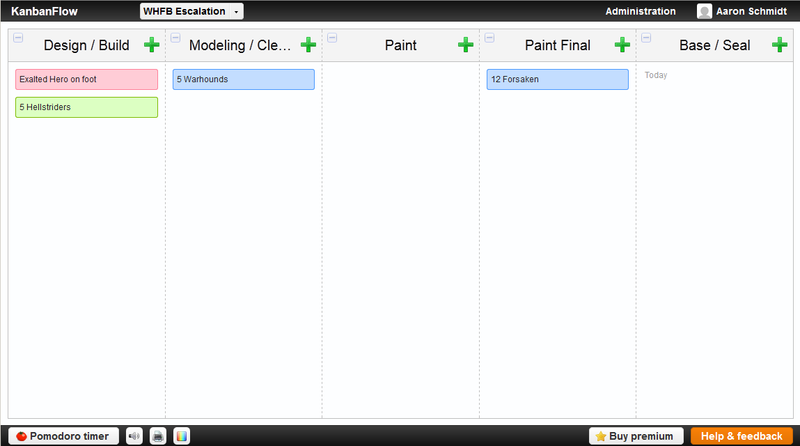 This is a screen-grab of the Kanban Flow screen of my rebooted Warriors of Chaos project. I am using this method to chip away at my Eldar project for WH40k and will eventually use it to reboot my Warriors of Chaos for WHFB. I’ve got a Kanban board for Flames of War stuff as well, but that is more of a simple Kanban implementation, not an escalation project. The uses of a Kanban board are pretty new to me, so I am still learning the best way to implement one for my projects. I have learned that it is good to not overload the things with too many items. That can make the overview a bit too much to handle and stifle the feeling that anything is getting accomplished. This small bite approach seems to work best for me, and having the separate columns which show what phase a miniature or unit is in meshes well with my workflow. I am approaching each of these projects in 250-500 point chunks. The objective is to not start anything new until the present chunk is complete. What, no sticky notes? It’s not agile if you don’t have a wall covered in colored notes. Yes, but I have no room on my walls for sticky notes thanks to all the hobby sprawl. I have a task for next hobby sprint that I will burn down to affix stickies to walls. Previous Previous post: Farseer Complete! Next Next post: Eldar update!